Boston Harbor is at a critical moment in history. In an era of climate change and a building boom, how do we work together to create a waterfront that is accessible and resilient – truly a harbor for all? 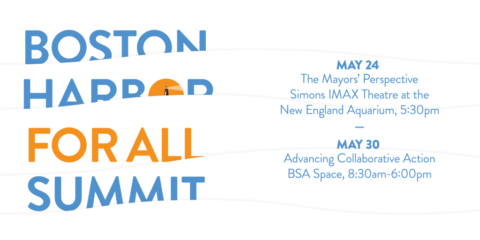 Join Boston Harbor Now and public, private, and nonprofit partners for a two-event, interactive series addressing our harbor’s opportunities and most urgent challenges, with a focus on how we can work together to take from planning to action key policies and projects. Our collective success in cleaning up the Harbor has created a new set of opportunities and urgent challenges. The planning and design decisions we make today will impact our waterfront for decades to come. Only by collaborating and breaking down silos will we get it right. Please note: Separate registration required for each day (May 24 and May 30). Join us for a discussion with Mayor Kim Driscoll of Salem, Mayor Thomas McGee of Lynn, and Mayor Martin J. Walsh, on the harbor’s role in the regional economy, climate resilience, public access and open space, water transportation, and public health and well-being. Join us for a day-long symposium on how to realize the opportunities for great public spaces and parks, more equitable and innovative development, a strong working port, and long-term climate resilience. Registration includes waterfront tour, lunch and conference.